Ultrasound, which is also referred to as Sonography, is a painless exam that involves exposing a certain part of the body to high-frequency sound waves to produce pictures of the inside of the body. Sonography exams do not utilize ionizing radiation. Because ultrasound images are captured in real-time, they can show the structure and movement of the body’s internal organs, as well as blood flowing through blood vessels. Doppler is the name for the special technique that evaluates blood as it flows through a blood vessel. 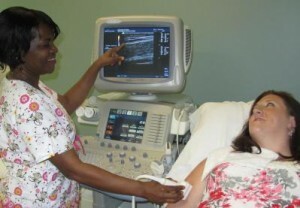 Most ultrasound examinations are painless, fast and easy. The scan generally takes about 30 minutes to complete. In most cases, the patient is positioned lying face-up on an examination table. A clear gel is applied to the area of the body being examined in order to help the transducer make secure contact with the body. The technologist then presses the transducer firmly against the skin and moves it back and forth over the body part. Once the imaging is complete, the gel will be wiped off your skin. Pelvic/Transvaginal Ultrasound-Drink (4) 8 oz. Glasses of water 1 hour prior to your exam. DO NOT EMPTY YOUR BLADDER.